The Koolie dog, also known widely as the Australian Koolie, German Koolie and the German Coolie, is an Australian Dog breed. It is an active herding dog that has existed in Australia since the 1800s. The lineage of the Koolie can be traced back to British working dogs. Koolies are regarded to have different breeds rather than different types within the same name. Generally, they are classified based on their ability to work rather than their body conformation. The weight of Koolies range from 15 to 24 kg and their height can vary from 40 to 60 cm. The Koolie dog is an excellent herding dog due to their ability to circle widely amongst livestock. They are able to round the sheep up and guide them back to the owner. Koolies are reputed for being silent, hardworking and loyal dogs. Thus, Koolies are indispensable when quiet careful work is required during lambing time for the shedding of sheep. It is widely believed that the Koolie is the result of the breeding of the smooth coated blue merle Collie from Britain and the Black and Tan Collie from the Highlands of Scotland. Some say that the dogs were used by Germans in South Australia who pronounced the dogs as “coolies” instead of “collie”. While others say that the Koolie is derived from the derogatory term “Coolie” used to refer to migrant workers in Australia. Either theory is unproven. Records show that the Koolie has been around for 160 years. Over the years, the Koolie is influenced by the breeding of Kelpie and the Border Collie. In 2000, to keep the breed of Koolie intact, the Koolie Club of Australia was formed to promote the Koolie breed. In 2006, the Stockdog Committee of the Australian Shepherd Club of America voted to accept the Koolie as a recognised herding breed. Admission was successful in June 2006. And in 2006, the American Herding Breed Association officially included the Koolie onto their list of recognised and accepted breeds. There were attempts to make the breed into a standard type, but due a lack of proper documentation and records to establish bloodlines, plus the occasional discovery of new types, it is difficult to establish the official recognition of the breed. In days gone by, blue eyed Koolies were common. However, when the blue eye characteristic was linked to the merle syndrome, which causes blind and deaf pups, selective breeding has led to the decline of blue eyed Koolies. This safe breeding practice still continues today. The common eye colour of Koolies are brown eyes for reds and brown or black eyes for blacks. There is still some slight tinge of blue in some of the Koolies but its hard to find one with full blue eyes. In the north of Queensland and New South Wales, Koolies are tall, medium boned and agile. They are bred for herding duties for Simmental Cattle and Brahma over very long distances. In the Hunter Vally region and Snowy Mountains of New South Wales, Koolies looks thicker, stronger and shorter. These physical attributes allow them to drive the cattle from the bush and gullies. In general, Koolies are bred to fulfil the requirements of the farmer and owner. Agility is one of the most important quality in a Koolie. Body length of the Koolie ranges from 40 to 60 centimetres. There is a huge variety of body coat colour and body type. Colors include red, black and even bi colored. Because they share the same genetic makeup as border collies, Koolies are sometimes mistaken for their Border Collie counterparts. 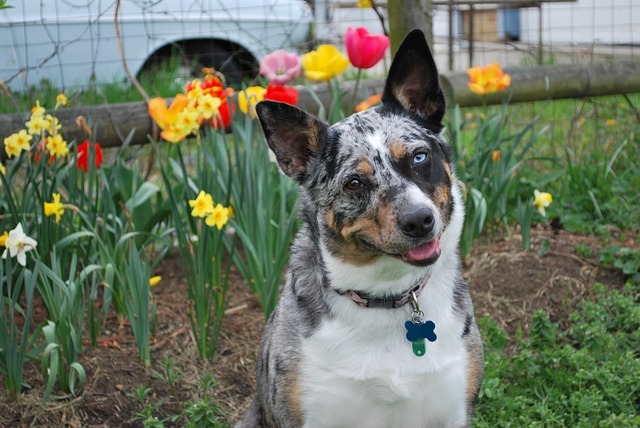 Koolie have a variety of coat ranging from short/smooth, short/medium to long coat. The body shape of the Koolie is longer than it is tall. Most Koolie owners prefer to have short coat as they are easier to maintain. Due to the heavy herding work for most Koolies, a short coat also reduces the possibility of infection due to parasites. Koolie colours can be solid (all one colour black or red/chocolate this includes Koolie who are cryptic merle: carry the merle gene but do not display it obviously) “bi” (black & white or red & white) “tri” (solid red or black, with white markings, normally with brown points), or “tri merle” (same description but merle) “merle” (grey, black,red/chocolate or white undercoat with large splashes of darker colourings of red/chocolate for red merles or black, grey for blue merles). Black Koolies will commonly have a black nose with black eyes, or tones of black including blue. Red and Chocolate Koolies usually possess a red or chocolate nose with brown eyes or a combination of both black or brown. Koolies are revered for their working ethic. Dairy farmers and stockmen always selected the Koolies bred for hard work. With selective breeding, the Koolie has evolved to become a loyal mean working dog. Koolies are known to form strong bonds with their owners and demonstrate an innate ability to lead the livestock. The quiet manner in which the Koolie goes about doing its job should never be mistaken for timidity. Though the Koolie appears shy and reserved, it can be trained to be disciplined and strong willed to perform its tasks. Most of the experienced farmers know how to extract the best from Koolies so that they can exhibit their qualities. However, it is important that Koolies be trained early to ensure absolute obedience. When well trained, Koolies prove to be diligent and consistent in their herding work. Koolies are also known to be patient, dedicated and devoted to their tasks. Not known of any natural aggression, the Koolie does exhibit some element of dominance while at work. The hardiness, combined with everlasting enthusiasm for work, make the Koolie one of the best gifts a livestock farmer can ever ask for. Some Koolies are late bloomers. They might not display herding instincts in their first two years. But given proper guidance and patience, late bloomers prove to be handy help in the fields. Non herding Koolies are also widely used for other tasks such as human assistance or part of alert and bomb squads. However, the Koolie is not meant to be an apartment dog. It needs constant daily activities to exhaust its energy. To keep a Koolie, you will need at least a large yard and someone in the family to exercise with them. The average life span of a Koolie dog is about 18 years. Due to the large gene pool of Koolies, there are limited genetic issues found in the Koolie. However, due to the merle which can produce blind and deaf pups, it is important to practice selective breeding. Due to their work load, some the Koolie dog can suffer from joint problems due to constant turning and twisting during herding work. Other than a few rare cases of skin allergies, the Koolie dog breed is a very hardy dog indeed. Before you head down to the pet shop to buy your Koolie puppy, make sure you remember the pointers you read in this article. There are countless of Koolies given up at rescue centres due to the lack of understanding of this breed and irresponsible breeders. There are cases where the dog owner bought from an irresponsible breeder, only to find out that his dog is deaf after 2 years. Though some dog owners will continue to keep the dog, it is unthinkable that some chose to discard the dog upon such discovery. There were also instances where the dog prove too much to handle because the owner was not expecting the high energy level of the dog. Keeping a Koolie in an apartment will surely spell disaster as most of the home furniture will be ruined if he is not given enough exercise. Only make the purchase of any Koolie from a reputed breeder. Now you know about the merle breeding that causes blindness and deaf, you should avoid all irresponsible breeders out to make a quick buck but produces blind and deaf offspring. NEVER support an irresponsible breeder. Do not give your money to such cruel practices of producing blind and deaf pups. As the Koolie dog is usually kept in a short coat, it is very easy to maintain. Koolies need little attention and just need the occasional bath when necessary. It does not shed much. Overall, the Koolie Dog is a hardy and diligent dog. Koolies are born to please and are intelligent, loyal dogs. Not really suitable for the apartment, the Koolie will display his utmost potential as a herding dog on the farms.